It seems that the Canadian dish poutine has become all the rage. Traditional poutine consists of french fries smothered in gravy and fried cheese curds. 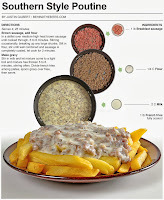 I have seen it a couple of times on the Food Network and to my surprise poutine is now featured on the special temporary menu at Buffalo Wild Wings – which I ate at last weekend. The BWW version had cheese curds, gravy, pico de galo and probably something else I’m not remembering right now, overall, I thought it was pretty good. 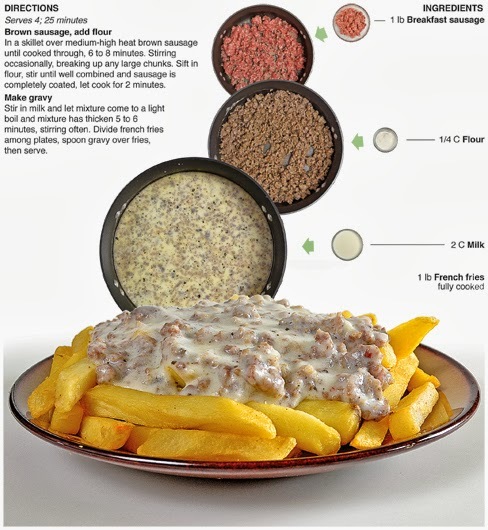 While I was eating it, I thought I could probably make an awesome poutine myself, as I thought more it hit me all at once – mine would be fries smothered in SAUSAGE GRAVY!!!! A southern style poutine that replaces cheese curds with sausage – the culinary Gods had spoken and I was hearing them loud and clear. I love biscuits and gravy. I love french fries. 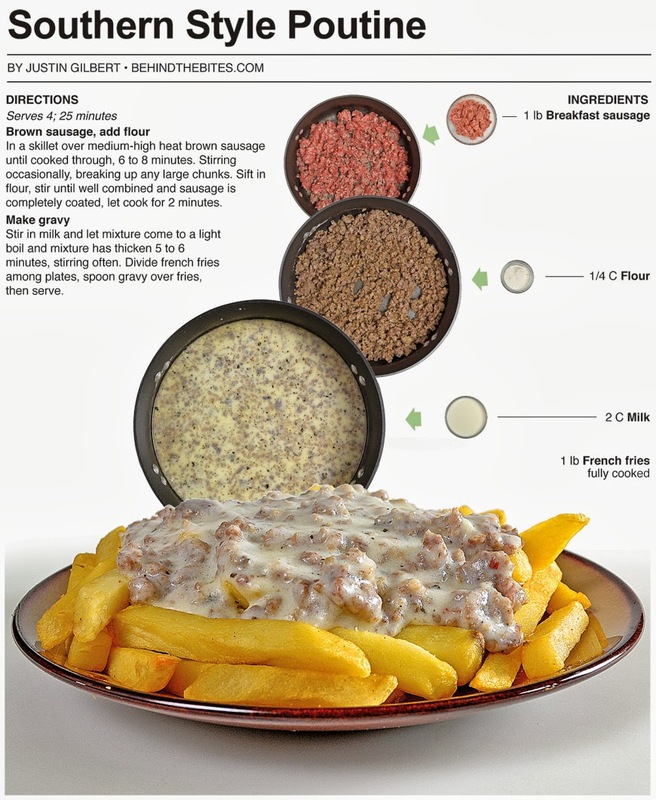 French fries and sausage gravy – that’s like culinary heaven! The gravy takes just three ingredients. Fries can be bought in the freezer isle baked. So really there is four simple items at work here and it’s a filling dish. I ate a huge plate and was so full I had to rolled to get anywhere for a couple of hours and then I needed a huge nap. 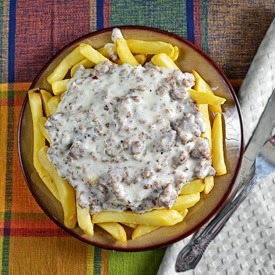 I have made this sausage gravy recipe for the blog two times before. One for traditional biscuits and gravy and the other for a gravy smothered breakfast plate. It's delicious and simple and I thought it would work perfect for my Southern style poutine. I thought about doing something extra or trying something new, but I couldn’t bring myself to do it with this recipe in particular. It had been a while since I had made it and I could not wait to scarf a batch of it down. I took all new pictures, just in case I use this gravy in another recipe soon - I’m thinking that this sausage gravy could be the replacement for cream of mushroom soup in a spectacular green bean casserole! – but more on that in a couple of months, when we get closer to Thanksgiving. In a skillet over medium-high heat brown sausage until cooked through, 6 to 8 minutes. Stirring occasionally, breaking up any large chunks. Sift in flour, stir until well combined and sausage is completely coated, let cook for 2 minutes. Stir in milk and let mixture come to a light boil and mixture has thicken 5 to 6 minutes, stirring often. 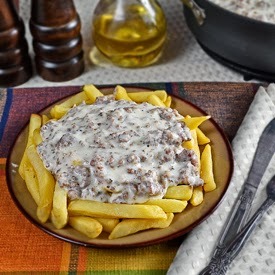 Divide french fries among plates, spoon gravy over fries, then serve.